In 1960, burgeoning actress and defiant dreamer Lena Spencer opened a small, grassroots coffeehouse in the quaint upstate New York town of Saratoga Springs. Within her then-husband’s plan to start the Caffè as a means for the couple to artistically flourish while “making enough money to retire in Europe” lay the seed of a more impactful cultural contribution that would change music history forever. It was a time in America when a coffeehouse could be something more—a focal point for a different sort of people, radical new ideas, and notably, emerging artists. Caffè Lena’s humble stage regularly welcomed musicians such as a young Bob Dylan in 1961, the singer/activist Bernice Johnson Reagon in 1962, and a pre-”American Pie” Don McLean in 1965. 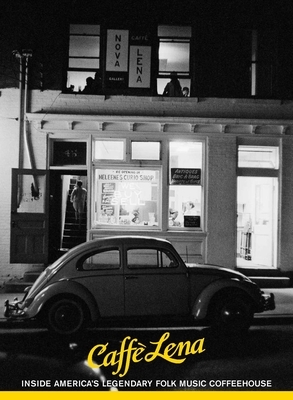 Quickly, Caffè Lena took its place among the nation’s foremost incubators of an American folk movement that inspired a generation of musicians, artists, and thinkers and a country in need of a new vision of equality, freedom, and understanding. Fortunately for posterity, camera shutters were often snapping in time to the music, and so an intimate visual record of Caffè Lena’s early years exists. Now, thanks to years of dedicated digging by the Caffè Lena History Project—to unearth Lena’s secret memoirs, collaborating with photographers to identify and rescue mysterious negatives, and collecting stories from the original artists to highlight these materials—the time has come to share this treasure trove of authentic and rare Americana with the world. Caffè Lena: Inside America’s Legendary Folk Music Coffeehouse brings more than 200 never before seen, evocative images and stories to the public. Early 1960s photographs of Bob Dylan and Pete Seeger and modern-day images of Rufus Wainwright and Patty Larkin blend with rare memorabilia and an oral history derived from more than 100 original interviews of artists who have graced Caffè Lena’s stage over the decades, including Ani DiFranco, Utah Phillips, Dave Van Ronk, Spalding Gray, and other luminaries of the folk, blues, jazz, and theater worlds. This exclusive time capsule chronicling the heyday of Caffè Lena—now the country’s oldest continuously operational folk music coffeehouse—provides an insightful look at the many artists whose poetic lyrics cast a mesmerizing spell over a generation, and who remain beloved today. Alongside the release of Caffè Lena: Inside America’s Legendary Folk Music Coffeehouse, San Francisco’s Tompkins Square label will release the 3-CD box set, ‘Live at Caffè Lena: Music From America’s Legendary Coffeehouse, 1967–2013′ on September 24, 2013. Jocelyn Arem is a folklorist, producer, consultant, and musician, who played her first professional gig on Caffè Lena’s legendary stage. Inspired by the Caffè’s history, she began to document the legacy and cultural impact of the venue and its founder. The publishing of this remarkable collection of stories and images is the culmination of Arem’s decade-long work as Director of the Caffè Lena History Project in association with the Library of Congress and in collaboration with Caffè Lena Inc. Her writing appears in the American Folklife Center News, The Association for Recorded Sound Collections Journal, and Boston Beats magazine, and her research has been featured on NPR, NBC, CBS, ABC, in American Airlines Magazine, and at GRAMMY week in Los Angeles. In partnership with Magic Shop Studio and the Joe Alper Photo Collection LLC, she is producing a boxed set of original Caffè Lena recordings and an exhibition of Joe Alper’s Caffè Lena photographs to accompany the release of the book. Joe Alper (1925–1968) is responsible for widely recognized and historic jazz, folk, and blues performance photography, including candid shots of the folk revival and the civil rights era. Joe and his wife, Jackie Gibson Alper, played a key role in supporting Lena Spencer and her Caffè, often housing musicians at their nearby home in Schenectady, New York. Jackie’s musical/political career included singing with the original Almanac Singers, becoming the fifth member of the original Weavers folksinging group, befriending Pete Seeger and Woody Guthrie, and hosting WRPI’s Mostly Folk radio show from 1971–1993. Joseph Deuel has been an avid photographer since grade school. He discovered Caffè Lena during high school in the early 1970s and has been taking photos there ever since. Many of these photos have found their way to nationally distributed CD covers and magazines. Mr. Deuel has been a frequent sound engineer at Caffè Lena since the late 1980s. "The legendary venue-America's oldest continuously operating folk-music coffeehouse-is celebrated in...Caffe Lena, an illustrated oral history." "The book’s very existence highlights one of the little-told stories of the folk movement: its spread beyond the well-trod centers of Greenwich Village, Boston and San Francisco into Middle America." "Joe Alper's photographs blend with rare memorabilia and an oral history derived from more than 100 original interviews of artists who have performed on Caffe Lena's stage over the decades."